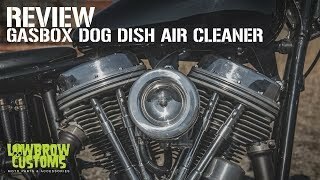 Gasbox introduces the new Dog Dish Air Cleaner. 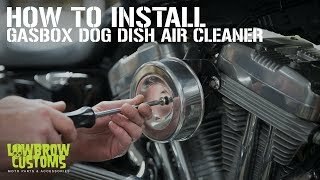 This air cleaner features a hand spun polished aluminum cover with a high quality element for high flow as well as superior protection from dust and dirt. This kit also includes a black powder backing plate and all necessary mounting hardware. Diameter of Cover is 5-3/8". See Lowbrow Customs SKU 010283 for replacement filter elements. Made In Cleveland, Ohio USA. I love the look but have suffered greatly due to the lack of airflow. The bike is not getting enough air due to the filter. There is a K&N I was told to buy but I am skeptical it is a surface area issue. The air filter issued in the video is different than the one received. I've used three of these now; two on Super E's, one on a CV. No re-tuning needed and drop-dead simple install. Low key, non-decorated style is functional and will never go out of style. Thanks Gasbox and Lowbrow! Great quality aircleaner. Nice, small and clean looking.